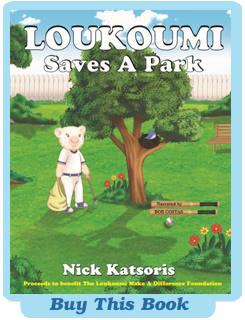 In Loukoumi Saves a Park by Nick Katsoris, Loukoumi is disappointed to find her park will close because no one takes care of it. Her friends pitch in to clean up and learn to how important it is to preserve the environment. Bob Costas, Loukoumi Saves a Park narrator, has won 28 Emmy awards – more than any sports broadcaster and he is the only person ever to have won Emmys in news, sports, and entertainment. Bob’s peers have named him the “National Sportscaster of the Year” a record eight times, and in 2012, he was elected to the National Sportscasters and Sportswriters Hall of Fame. In the summer of 2018, Bob was also inducted into the broadcaster’s ring of the Baseball Hall of Fame. 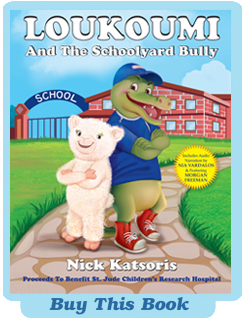 Proceeds from the book benefit The Loukoumi Make A Difference Foundation. Loukoumi is disappointed in her Easter basket each year because she wants a lamb in her basket instead of an Easter Bunny. As the adventure progresses Loukoumi visits a magical wonderland of sweets with a candy river, hills made of marshmallow chicks and jelly bean petaled flowers in every color. Loukoumi then meets the Easter Bunny, who is contemplating skipping his Easter journey this year. 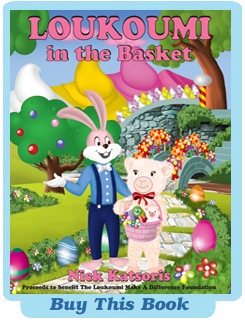 In the end Loukoumi saves the day by helping the Easter Bunny and learns that Easter is about more than just what she receives in her Easter basket. Have you ever been bullied about your name? Has your child come home from school complaining about an interaction with a schoolyard bully? Bullying plagues students in schools around the world, and now Oscar Winners Morgan Freeman, Olympia Dukakis and Oscar Nominee Nia Vardalos lead an all-star cast in the audio narration of the new book, Loukoumi And The Schoolyard Bully by Nick Katsoris (November 2013: Dream Day Press), which teaches kids that bullying is not cool. Proceeds from the book benefit St. Jude Children’s Research Hospital. and feelings of melt-in-your-mouth pleasure and comfort. Is yours buttered cinnamon toast? Your mama's potato salad? After-school English muffin pizzas? 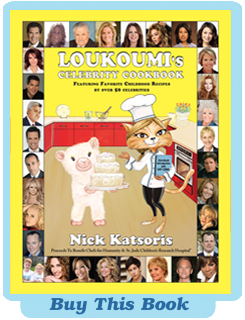 Now, Nick Katsoris, author of the acclaimed and award-winning children's book series featuring Loukoumi the fluffy lamb, has gathered the favorite childhood recipes of more than 50 celebrities in his delightfully illustrated new cookbook for children and their families, Loukoumi's Celebrity Cookbook. A minimum of $2 from the sale of each book will be donated to Chefs for Humanity and St. Jude Children's Research Hospital. 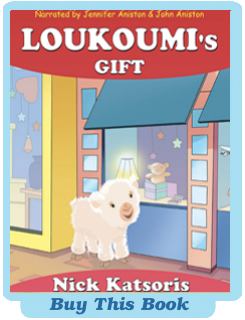 Loukoumi's Gift is the fourth title in the award winning series of illustrated books by Nick Katsoris. Featuring a bonus download of the story narrated by Jennifer Aniston and Days of Our Lives star John Aniston, the new book follows Loukoumi through her day as she discovers that the perfect gift need not cost a lot of money, but instead can come straight from the heart. 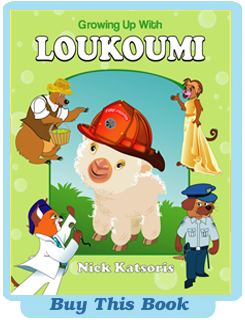 The narration also features the voices of Academy Award winner Olympia Dukakis, Grammy Award winner Gloria Gaynor and more/ .Loukoumi's Gift continues the adventures of Loukoumi and her friends Gus the Bear, Fistiki the Cat, Dean the Dog and Marika the Monkey. Kids will learn that there are many cost free gifts that can make a huge difference in the lives of those around them. This message is especially important to kids during these tough economic times. The book encourages kids to do something nice or make something for their loved ones as evidenced from the book's recurring line: A gift is a thought your heart creates and need not cost a penny. A gift can be anything that you wish made for one or many. A thoughtful act, a handmade card, a delicious cookie or cake. The perfect gift comes straight from the heart, whatever it is you make. 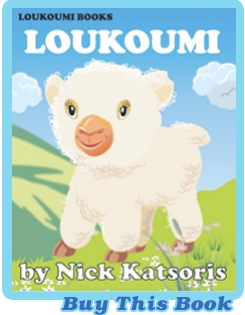 Loukoumi, the fluffy, cuddly lamb, returns with Loukoumi s Good Deeds, the third title in the award winning series of illustrated books by Nick Katsoris for children preschool and ages 4-8. Featuring a bonus CD narrated by Jennifer Aniston and her father Days of Our Lives star John Aniston, the new book follows Loukoumi through her day as she discovers how easy it is to make other people happy by doing something nice. 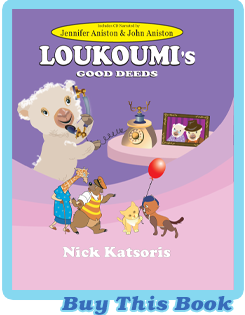 Loukoumi s Good Deeds, by Nick Katsoris, continues the adventures of Loukoumi and her friends Gus the Bear, Fistiki the Cat, Dean the Dog and Marika the Monkey. Whether it's cleaning the house, lending a helping hand or showing your grandparents how much you love them, kids will find that each good deed is unique in its own special way and can make a huge difference in the lives of those around them. In Growing Up With Loukoumi, Loukoumi struggles with what she wants to be when she grows up. She considers becoming a firefighter, a judge or a doctor. As she walks along, she encounters her friends including Gus the bear, Fistiki the cat, Dean the dog and Marika the monkey. Each friend explains to Loukoumi that she can be whatever her heart desires. If she wants to be a singing star, a policeman or even an Oscar winning actress, then she can do it! The key is that she must always believe in herself, stay positive and work hard, because if you believe in yourself your dreams will come true! The CD version of the book (included) features the voices of singing legend Gloria Gaynor, (Grammy Award winner for I Will Survive) Oscar-winning actress Olympia Dukakis, national CBS correspondent and MarketWatch anchor Alexis Christoforous, American Idol Heartthrob Constantine Maroulis, and Guiding Light actor Frank Dicopoulos. Each voices a character that encourages Loukoumi to reach for her dreams, which is especially meaningful when being heard from such inspirational and successful adults. The package also includes an original song from Gloria Gaynor called, "Believe". Growing up with Loukoumi, for a celebrity narration.